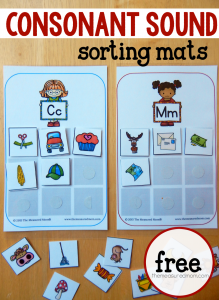 Looking for beginning sounds worksheets? Try these fun coloring pages! A year and a half ago, I created beginning sounds coloring pages for my Three, who was almost four years old. Since he loved to color and had a pretty good handle on beginning sounds, I thought he’d enjoy a set of alphabet coloring pages. Now that little boy is my five-year-old. He’s far past beginning sounds and is reading books like this one as a kindergartner. So I updated the pages with funny face letters and better clip art. Plus, I added an uppercase set. We love them, and I hope you will too! Our current Three (he’ll be four in a few months) doesn’t have the early reading skills his older siblings had at his age, but he does recognize all his letters and is pretty good at naming their sounds. He is happy to do one or two of these pages at a time. Let me give my standard disclaimer and say that I don’t think you should make worksheets the main part of your instruction with young kids. I suggest using these pages after your child has mastered beginning sounds, or do them alongside your child as you talk about the beginning sounds together. This is what my original set looked like. When my older son did these as a young preschooler, he wanted to color all the pictures. I didn’t expect him to do the pages any certain way as he was so young. But when he was close to four, I told him he needed to first color the pictures that began with a certain sound. Then he could color the rest of the pictures if he wanted. Have you seen these popular freebies? We use and recommend this jam-packed resource! These are great…thank you! I’m looking for things to keep the littles busy during the hot part of the summer and these will be perfect. 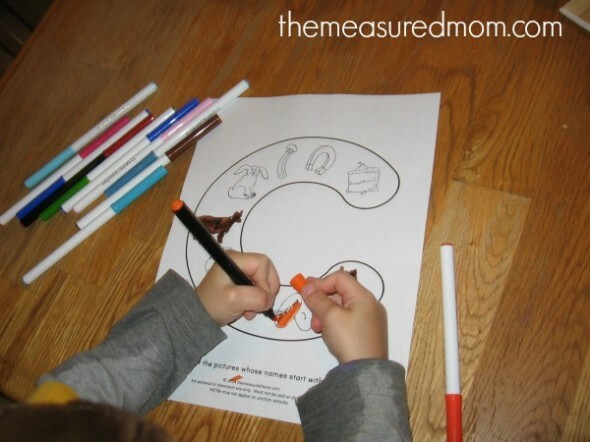 Is it possible for me to get your original lowercase coloring pages. My daycare kids are at that level, with less pictures than your new set. Your worksheets are really great resource that enrich the entire teaching experience. Teaching is thought to be a noble jobs and you are making it more nobler with your resources. Thank you so much Anna for these great resources! This will be one additional tool in my toolbox for teaching letters to my daughter! She absolutely love to color things so I know these will be a hit with her. I’m glad you can use them, Katie! Wow! Just perfect for my little one! He’s gonna love it! I love these! Can’t wait to use them. Pinned it! Thanks for sharing! These are great. Thank you for sharing with all of us! It would be so great if you provide a short vowel sound page and a long vowel sound page. I am a Montessori teacher and we teach short sound first. Thanks for the suggestion! If I do get a chance to do that I’ll be sure to leave another comment so you know. What a great resource. Can’t wait to print them! Anna, the pages are so great! I like them so much. My son will have a lot of fun colouring them! Thank you! You’re very welcome, Tatiana – enjoy! Thank you! I’m a retired K-1st grade teacher and now working with my kindergarten granddaughter? These are the best I have seen in a long time. Fantastic idea. I am planning to print them out for my soon to be 2 yr old. What I like about these is that most children learn to identify the capital letters of the alphabet, but have some difficulty in identifying lower case. These are all lower case & having them colour in the correct matching pictures to the letters is a great idea in encouraging them to learn to identify the sounds. I have also been using Brainy Baby dvd’s for my daughter since she was 2 months old & I absolutely swear by how great they are. At 20 months she was identifying over 100 different animals & objects, she knows her colours, shapes & her whole alphabet as well as numbers 1-10. I highly recommend them for a parent wanting to have their child get the best start in education. They can be found in baby stores & also online, but are popular, so go out of stock quick. Just wanted to add this in for anyone wanting to teach their tots extra. The dvd’s are awesome. Thanks for sharing your printable alphabet letters, they are fantastic, I will definately be following in Pinterest. Thanks very much for sharing these! My daughters have been enjoying them. I’m so glad to hear that, Jasmine! Thank you so much for these. My daughter seems to really respond well to a lot of the items I print, as a Subscriber of your wonderful helpful blog. Thanks again! This is really great.It helps children lots.I loved it.Thank you for sharing. Thanks so much, these are great. In New Zealand we only teach lower case phonics so these are perfect for my New Entrant class. I just with we spelt ‘coloured’ the same way so I don’t have to alter each sheet (not that the kids will notice I’m sure!). Yes, too bad for those funny spelling differences that make it a little challenge for you. My daughter notices them in books she reads sometimes and is quite sure there’s a typo, ha! So glad you can use these, Maryo! Once again, thank you! I love your website! Hi Kayla, Can you explain your question again? I’m not sure what you’re asking. I actually never had the bubble letters with uppercase posted – just the lowercase, which you can still get here. Unfortunately I won’t be doing uppercase ones. I have too many projects with the baby coming in just a few weeks! These are fantastic just as all resources are. Thank you for sharing all your hard work. Let me just say that these are FABULOUS!!! I seriously link to your site every day on my blog because I love it so much! Thank you very much! My children love it. The link for the letters will not open. Is the doc still available? Still there! Did you click on the box that says “is the file not downloading or printing correctly?” Those tips usually work. These letters are adorable! They look like fun for the kids. Thank you so much for sharing this with us. I’m printing out in hopes for working with my 4 year old from home since we didn’t qualify for Pre K. Don’t want her falling behind. I hope she enjoys them, Martisha! Thank you so much for this amazing resource . I’m glad you can use these, Janice! 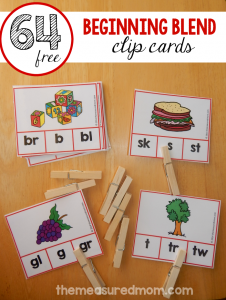 These are great, will be using it with one of my first grade friends who is still struggling with letter-sound correspondence. My only suggestion would be to change the images for the letter “x. The correct pictures don’t represent the true sound that it makes as there are no words with an initial consonant “X’ that makes the true sound /ks/ — you have X-ray (says its name, not the sound) and xylophone (makes a /z/ sound not /ks/). Instead I would include pictures like — fox, box, six as the “correct” photos for the letter X. 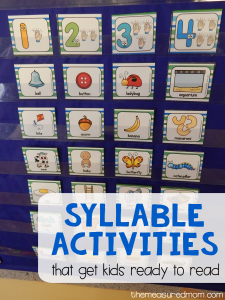 Yes, I do that for almost all my beginning sound printables for letter X. For this set I decided to go with the standard X-ray and xylophone, but your point is a good one. hi Anna! 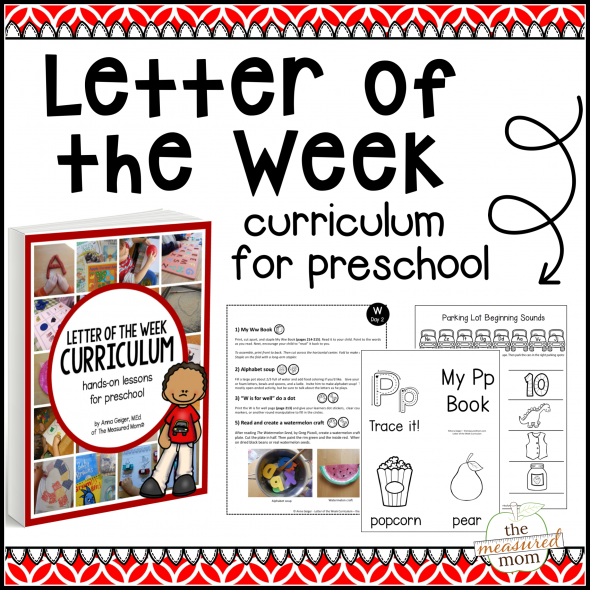 i love your upper case/lower case alphabet+picture worksheets! adorable and super fun! also, is it too late to get the digraph freebie for subscribers? Hi Claire – I just added that to my subscriber freebie page. Just check your most recent newsletter for the link and password. As an email subscriber, go to the subscriber freebie page and use the password. You got it in your first email when you started following my site. If you are receiving the newsletters, it’s at the bottom of each one. Love these!!! Thank you for sharing these with us. I did notice a error on the uppercase Z page, the zebra graphic (close to the bottom of the page) is superimposed on the Christmas tree graphic. Lowercase Z is the same way. My daughter, at age 4, really loves to do the beginning sound coloring pages with me. We’ve been doing a ‘letter of the day’ every weekday for a month or so now. These pages are a good teaching aid for learning the sounds letters make, and for being able to pick out what letter a word starts with. After doing the sheet together, we watch the Sesame Street 6 minute video podcast that corresponds with the letter of day. All of the video podcasts are available for free on Youtube, just search for ‘sesame street letter [letter]’. It takes about 15 minutes to do it all, and she learns very fast. Thank you for your work; it has been a real benefit for my family. Thank you so much for that feedback, Ron! I will definitely have to check out the Sesame Street podcasts. I love that they are just a few minutes each. I think my 3 year old will enjoy those! I’m so glad to hear that, Aylin! Thank you so much for having all of these resources available for mamas like me. What an INCREDIBLE and free resource that you have created! I am so excited an amazed at your wonderful website, and the future my Boys have because of you! Oh, and the best bit? I am going to laminate these and use them for our roadtrip this weekend, as an educational tool for my 2year old and 3.5year old, to share and learn together!!! Yay! I’m so glad you can use these with your boys, Adrianna! Im so greatful.it is i deed a great help for us kindergraten teachers all over the world. Wow! Seriously can not believe you are offering them for free! Using them with my speech therapy clients 🙂 Thank you for your time and generosity. You’re welcome, Skylee! I’m so glad you can use these! 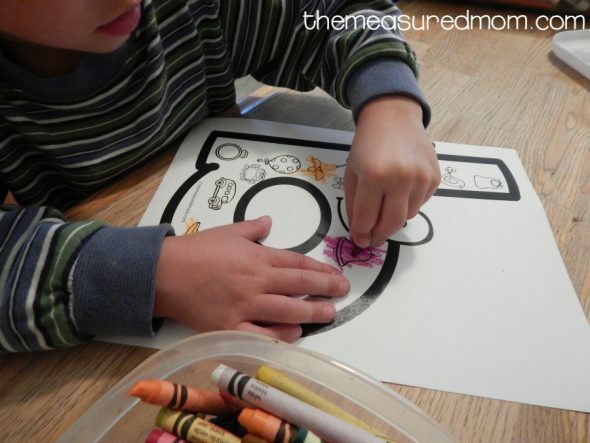 Such a great resource for my in home preschool kiddos to practice cutting/pasting into their journals and then coloring to identify the initial sounds. They’re loving these! Thank you! You are so amazing! THANK YOU so much for the Funny Face Letters! God Bless You!!!! I am so grateful for these resources!!! You’re very welcome, Erin! Thank you so much for the kind words! Such a great resource for students. 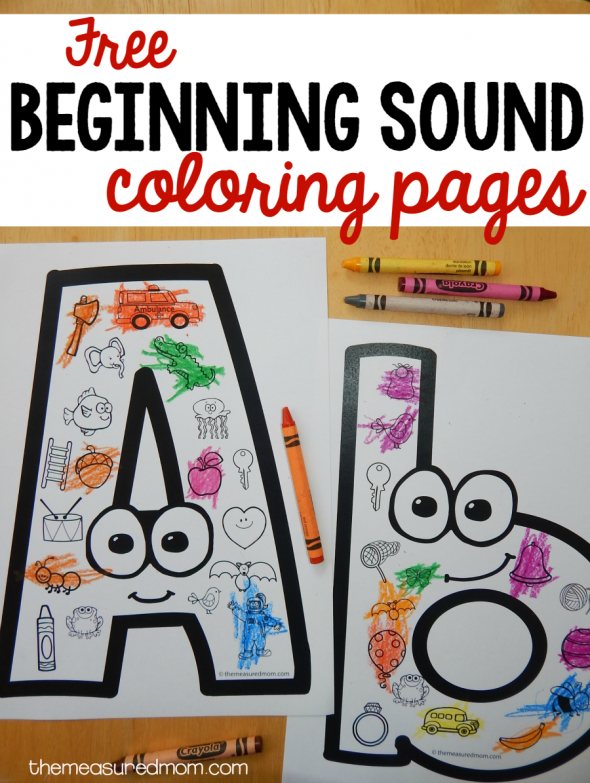 I love these beginning sound coloring pages! Just what we needed at our house! I’m so glad this is useful for you! you are so very awesome and i pray for your success. your activities and helpful projects are such a blessing. Thank you for your kind words, Claudia! I can’t get through to the download page. There are no links on the “limited time offer” page to actually get through. Thanks!